Meet ALL-NEW Engine Friend, Scruff !! Yes a new friend on the Island of Sodor! That's always exciting for Julien. This Christmas he got a few new engines to add to his train set. Now we'll have to be on the look out for Scruff! We're watching Wobbly Wheels & Whistles! right now as I post this. Toby's learning that it's ok to ask for help. Thomas is one of our favorites and I never mind having it on. Thomas & Friends always teach without sounding preachy and the trains are wonderful real toys. In Wobbly Wheels & Whistles! - riding the rails with preschool pal Thomas, you’re always in for a good time! Come aboard for four “fun”-tastic new episodes and meet new engine friend “Scruff” in Thomas & Friends™: Wobbly Wheels & Whistles­, coming to DVD, Digital Download and On Demand January 4, 2011 from Lionsgate and HIT Entertainment. Along with host Driver Perkins (who can be seen ONLY on DVD) engaging kids with interactive dialogue and extra fun, this all-new DVD will bring miles of smiles to young engineers everywhere. 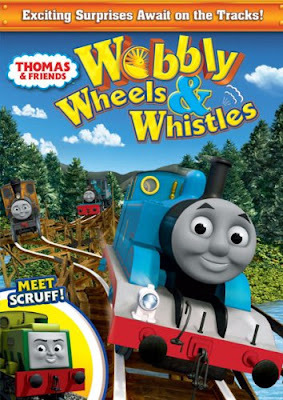 *Follow me @jamaise at Twitter & Tweet this : RT @jamaise #GIVEAWAY #WIN - A copy of Thomas & Friends: Wobbly Wheels & Whistles on DVD http://bit.ly/fumfkS ends1/10 tweet each day for one entry each ! I love the way they quietly teach kids lessons, and the kids really enjoy watching them. My daughter loves Thomas, and I know she would really enjoy this DVD. Please enter me. Thanks! Follow on GFC publicly under Anita Yancey #1. Follow on GFC publicly under Anita Yancey #2. Follow on GFC publicly under Anita Yancey #3. My kids love trains and love watching Thomas and Friends! I am a follower of yours and Thomas is a HUGE hit at our house. Each of my four children have loved him! We are big fans of Thomas at my house. My son ADORES Thomas and he is our favorite little steam engine! My older son loved Thomas the Train, we went saw him live on several occasions, now my younger son is just starting to watch Thomas. Thomas & Friends is a favorite at our house. #1 I like you on FB. #3 I like you on FB. I have always loved wholesome TV programs for my kids. TV is limited to programs that I believe will help them learn and keep them entertained. Thomas is one of them.